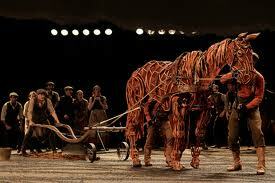 This weekend Collette and I saw the Mirvish Theatre production of War Horse at the Princess of Whales Theatre. 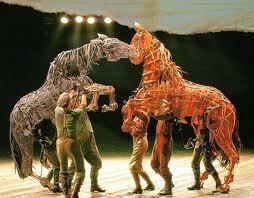 This is the play based upon the children's book by Michael Morpurgo and upon which the Steven Spielberg film is based. We have not seen the movie because we knew we would be seeing the play. After all, the stage play predates the movie. 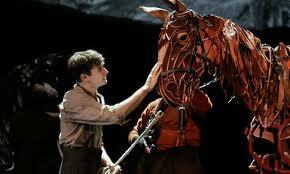 The war horse is called Joey and he is a major character in the story. He is not Disneyfied, he does not have a voice but by his actions and the reactions of the humans who meet him, we get to know Joey's character and we come to love him. 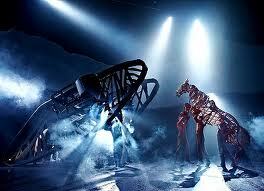 Like any contemporary stage production, the story of War Horse is told using a variety of techniques. 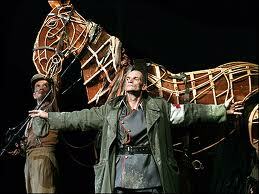 The play is not a musical but two Celtic musicians, women, appear on stage with violin and accordian and use what appear to be period songs to add to the story; they are like the play's Greek chorus and the voice of Tatjana Cornij sometimes floats across the theatre filled with longing and sadness and emotion. 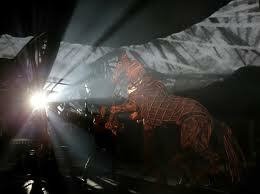 The play opens with the Tatjana and her fellow musician Melanie Doane as they sing a refrain about people being remembered by their deeds; the entire company appears out of the shadows to join in the singing and we meet Joey as a foal, and the officer who would one day ride him, sketching the Devonshire countryside. 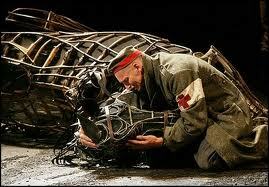 I can't talk about War Horse without talking about they horses. They are puppets, manipulated by a team of puppeteers, two of whom work inside the shell. 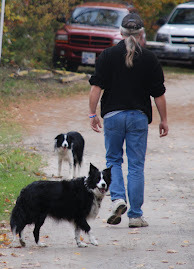 One person operates the head, bending the neck, twitching the ears, shaking the mane. They are wonderful and wonderfully performed. 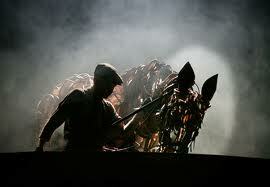 In that way that good theatre can operate, you soon forget the people and see only the horse. 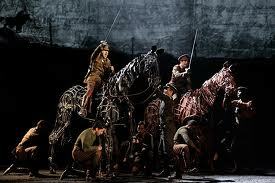 War Horse is an anti war story in the best possible way; there are no speeches on the evil of war, we are just presented with the evidence thereof; families torn apart, young man left bleeding on battle fields, horses charged into machine gun fire, horses dying. This, is of course, an emotional play. It is the love story of a boy and a animal companion and it is a story of how humans and horses alike are used up and destroyed by political powers beyond their understanding. Albert and Joey and Friedrich become heroes through circumstance; they are all travellers caught up in a nightmare journey, all of them just want to go home and their single minded desire to do so lead them to perform feats that others see as heroic. All of the stage production works here: From the horse and animal puppets (there is a white farm goose that is funny and terrifying in the ways only a farm goose could be), to the lighting and smoke effects that recreate the hallucinogenic effects of battle, to the scary and surreal tank, to the sound design which included the beautiful music as well as the wickering and screaming of the horses, to a backsplash screen that helped establish location and time ... it is all masterfully done. At times the staging and characters break off the stage into the audience; at one point one of the singers appeared in our balcony and a group of soldiers were staged at the front of the auditorium, just below the stage to represent troops in their trenches. There is a symmetry to the story which I always appreciated. 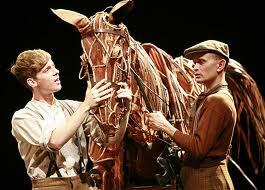 Part of that comes from story points, such as Joey's plowing skills serving him later as well as the music, with the play closing with the same song which it opened. In many ways it is a tragedy; people and horses die, their lives wasted, worlds and relationships are torn asunder .. but some constants remain: Love of family, bonding friends and comrades and the promise of a boy to his horse, made on the fields of England and cemented in the trenches of France.